Over this weekend Haworth village will host tens of thousands of visitors, mostly in costume, and consequently road access is not easy, with parking sometimes being a mile or more away from the centre of events. So let the train take the strain as the Railway has a big part to play in bringing people to this wonderful event. For people who come all the way by Rail, via the national network, you can use the cross platform interchange at Keighley. Those who choose to come by road can use one of our car parks at Oxenhope (where there is an overflow car park just up the hill on the left), Ingrow or Keighley. If the Keighley Car Park is full, then there is a huge car park on the other side of Keighley Station, off Dalton Lane, which is provided courtesy of the Keighley Campus of Leeds City College. On Saturday and Sunday EXTRA FREE car parking has been arranged NEXT to Ingrow West Station, so even more reason to “let the train take the strain”. Friday 15th – Sunday the 17th is the time in the Worth Valley when the 1940’s comes to Haworth Village, arguably the best 1940s celebration from all those that take part throughout the UK. This video from the Penny Steam archives of the 2014 weekend gives an excellent flavour of what the railway has to offer to complement this wonderful weekend of celebration. 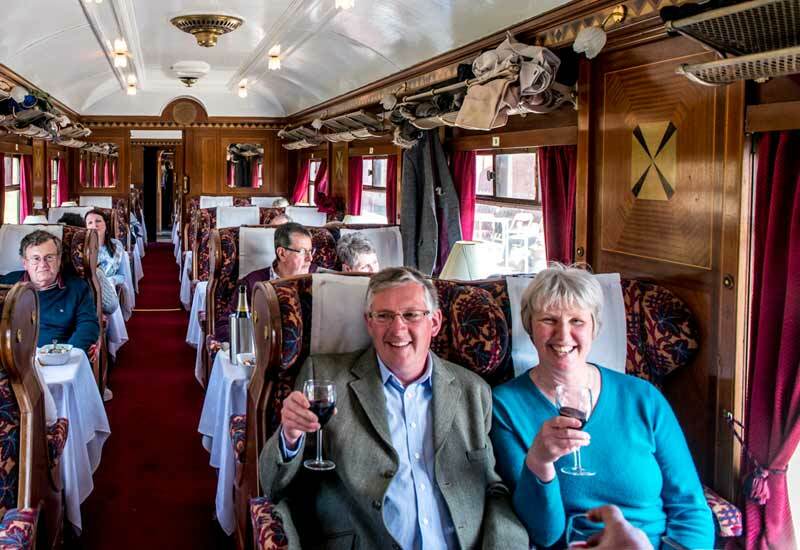 In the Exhibition Shed at Oxenhope, dressed in 1940s outfits, our catering volunteers will be serving Afternoon Teas on board one of our elegant Pullman coaches. The Exhibition Shed will be decked out in celebration of Victory in Europe and music of the time will be played as a background to eating your afternoon tea in style. Regular visitors will know that it is a steep climb from the station up the hill to the village. Fear not! A very frequent vintage bus service is provided all day to connect with trains at Haworth Station to take passengers to the top of the village, and it is all free of charge. And if that was not enough, you do not have fear the steep hill up to the village as a very frequent vintage bus service to the top of the village is provided, free of charge, from Haworth Station connecting with all the trains, all day. Throughout the year, 1940’s Weekends are a feature right across the country but one is arguably the best. 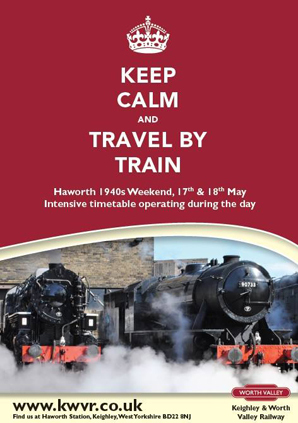 Do not miss the Haworth 1940s Weekend, as this weekend Haworth village goes back in time when thousands of visitors, mostly in costume, swell the streets of the village and take the whole atmosphere back to the 1940’s. The event is run by the Soldiers’, Sailors’ and Air-force Benevolent Fund (SSAFA) with the proceeds going to Forces’ Charities for the benefit of members of our armed forces and this year commemorates the 70th Anniversary of the D-Day landings of the 6th June 1944. Throughout the year, 1940’s Weekends are a feature right across the country but one is arguably the best. Do not miss the Haworth 1940s Weekend, as Haworth village goes back in time when thousands of visitors, mostly in costume, swell the streets of the village and take the whole atmosphere back to the 1940’s. The event is run by the Soldiers’, Sailors’ and Air-force Benevolent Fund (SSAFA) with the proceeds going to Forces’ Charities for the benefit of members of our armed forces and this year commemorates the 70th Anniversary of the D-Day landings of the 6th June 1944. To see the wonderful time that all the visitors have, the sprit that the event generates and just how much time and effort groups of 1940s enthusiasts dedicate to recreating the Britain of the 1940’s, watch ‘Spirit of the 1940’s by Make A Difference Films of the 2012 Haworth 1940’s event. The 2013 event over the weekend commemorated the 70th Anniversary of the World War 2 Dambuster’s Raid. Following our earlier announcement of ambitious plans to extend the locomotive shed and engineering facilities at Haworth, a meeting with architects took place about 3 weeks ago at which outline costings were provided. Once approved it is anticipated that the initial design and build period will be approximately 18 months. Further bulletins will be published as plans and timescales are finalised.